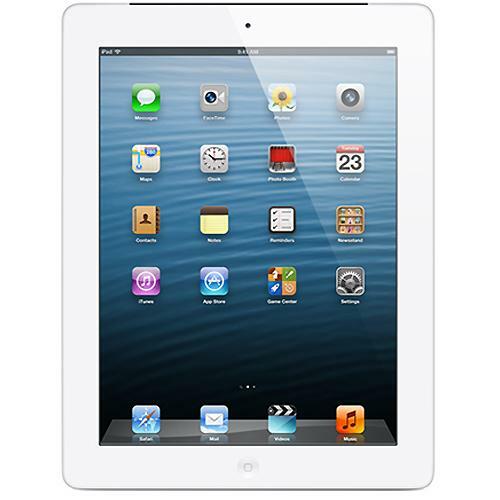 Apple’s iPad with Retina display boasts the best display in the Apple tablet lineup. With 3.1 million pixels intact on its 9.7′ screen, this 4th generation iPad makes every letter razor sharp and your media files bloom in color and contrast û all in a 2048 x 1536 pixel resolution. The 5 megapixel camera is as flawless as the display is rendered with the iSight feature that lets you take your photos in its best quality. Boosting the photo capture is an f/2.4 aperture, a five-element lens, and a hybrid infrared filter that makes your images more vibrant and stunning. The body is designed to be portable and durable û all less than 1.5 pounds and 0.37 inches thin of lightweight aluminum unibody. The reversible Lightning USB connector is also reduced to 80 percent in size and more durable. Apps and interface run smoother than ever with an A6X chip inside. Its performance is 2 times better than a standard CPU and that of the A5X chip from previous iPad generations. The version of the iOS boosts its performance further with a Multi-Touch feature that lets you navigate the iPad easily with your fingers. The iCloud app is also available to let you sync your files to all you iDevices and access them anytime and anywhere. All the high-grade visuals and camera features might give you the drain with how much you can do, but not the iPad’s battery. Designed to withstand activity up to 10 hours, all features are energy efficient and do not waste precious battery bars. If you want to connect to the world and tell them about your next achievement, this 4th generation iPad also holds a dual-band 802.11n Wi-Fi and Cellular connectivity. Channel bonding, 150 mbps download speed and LTE feature can give you the best online experience you can have. If you like multi-tasking and in need of an urgent assistant, or want the scores on last night’s game, Siri is here to help! Voice activated, Siri allows you to just call out to this intelligent assistant and she’ll know which apps to use and what to search!